International Scania's new R Series range of trucks has been elected International Truck of the Year for 2010 by a 22-strong jury of leading European commercial vehicle journalists. The ITOY award is presented every year to the truck launched in the previous 12 months, which is deemed to have made the greatest contribution to road transport efficiency. 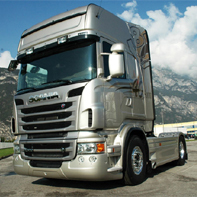 The Scania R Series, launched in September, fought off a strong challenge from the second-placed Volvo FH16. MAN's TGL/TGM series finished in third place and the new Mitsubishi Fuso Canter was fourth. The trophy will be presented in December at Scania's headquarters in Södertälje, Sweden. Building on the success of the outgoing range - elected Truck of the Year in 2005 - the new R Series impressed the ITOY jury not least due to its continued evolution. In particular, the latest model features a more aerodynamic cab profile that not only reduces fuel consumption but also improves the flow of air through the engine compartment, thereby aiding engine cooling--a factor that will be especially important for the forthcoming, next generation of lower-emission 'Euro-6' diesels. Scania's revised Opticruise automated gear-shifting system, launched on the new R Series, was also rated highly for its faster, smoother and more intelligent shift strategy. The ITOY judges further praised the Swedish manufacturer's new Driver Support System (developed on the R Series) which was seen by the majority of the jury as an innovative learning tool capable of providing a continuous and pro-active assessment of a driver out on the road, rating their fuel consumption, driving efficiency and overall 'road craft' with a simple yet effective 'star' rating system which encourages a driver to excel. Last but not least the R Series' highly-attractive new interior impressed the ITOY jury with its latest dashboard, high level of comfort and ergonomics. Summing up the jury's vote, the International Truck of the Year chairman Gianenrico Griffini commented: "During this extremely challenging time for the entire automotive industry, and especially for Europe's commercial vehicle manufacturers, Scania has delivered a 'state-of-the-art' truck that sets new standards in terms of fuel economy, driveability and overall efficiency."